Here’s how the Mommy and Baby Monster turned out. I really ended up loving the Zombie BBQ colorway from Lorna’s Laces. 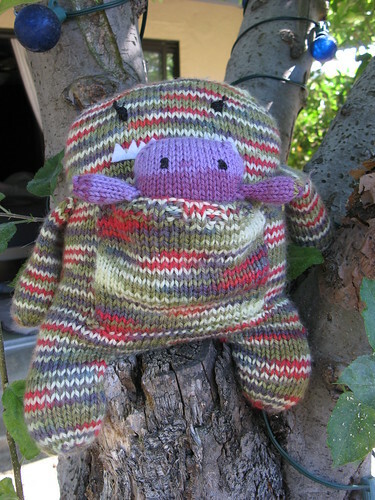 The baby monster is done in Ty-Dy Wool, by Knit One Crochet too. I love how it turned out too. Here’s a full body shot of the baby monster. I LOVE these colors! And they have many other amazing colors too. I also picked up a skein that is pale greens and creams, called medow, incase I had to make a boy baby. But, you might have already deduced, I’m having a GIRL! So I got to use the cute purples and greens, called blue pansy, for the baby girl monster 🙂 I think I’m going to have to use these skeins for some actual baby clothes now because they are gorgeous – and helllloooooo, they can be machine washed on delicate! My son loves these monsters. I started another one that was supposed to be him, but it is turning out too big, so he said it has to be his Grammy. How cute is that?! I’m itching to start knitting for this little baby that I am growing, but I don’t find out the gender until next week! 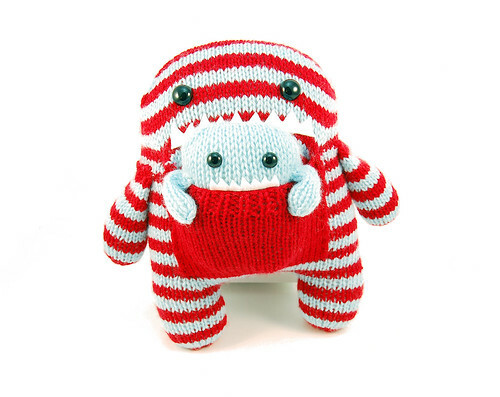 So, until then, I will work on a little monster for my little 3 1/2 year old monster. 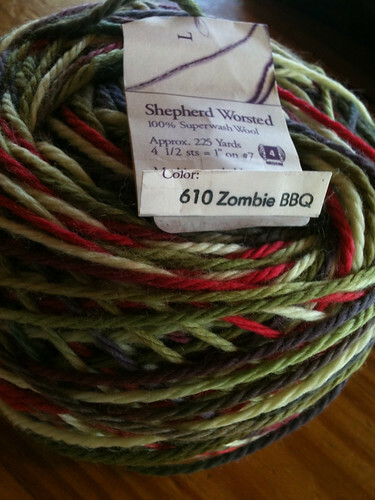 I found this perfect colorway by Lorna’s Laces called Zombie BBQ – how appropriate! AND it’s superwash which is a great feature to have for a stuffed animal. I am a big fan of Loran’s Laces. I used their Greenline yarn for my Vine Yoke Cardigan and it was dreamy to work with… the only down side is that it’s a tad expensive at ~$20 a skein. What can I say? I’m a yarn snob. I’m going to make a mommy, daddy, baby and kid monster – and I won’t be using Lorna’s Laces for all of those… we’d be looking at a $100 set of monster toys here! 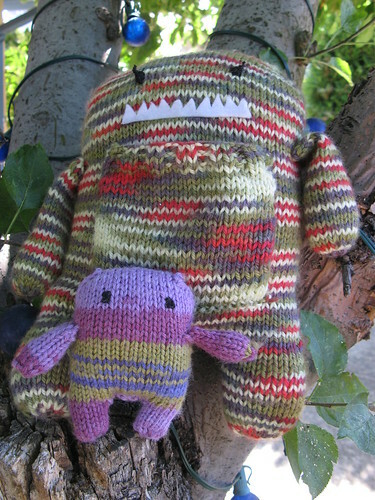 Here’s the picture of the mommy and baby pattern by Rebecca Danger. How freaking cute is that!! She has a really cute funky style to her stuffed animals, I really love them. I hope he likes them too.